If you had to live off one nationality of food forever what would it be? When I had that conversation recently it was a toss up between Italian and Thai. 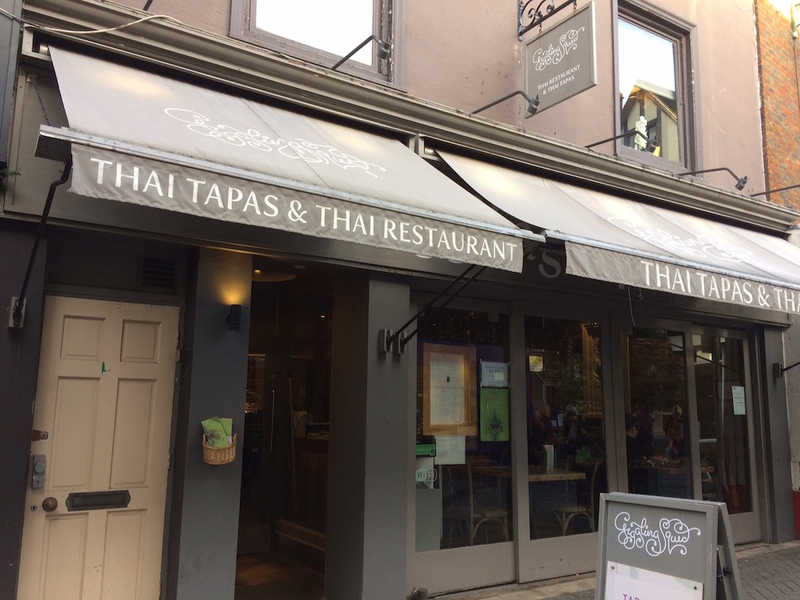 So it wasn’t perhaps so surprising that just a week after returning from a trip to Thailand I found myself having lunch in a Thai restaurant at home! You might think that it suffered by comparison – after all, I’d been eating the real deal for a week in some relatively off-the-beaten-track parts of Northern Thailand – but, no, this was Giggling Squid, and I knew I was in safe hands. Having eaten previously in the Hove incarnation of the restaurant (the company was actually founded by Pranee and Andy Laurillard in a fisherman’s cottage in Brighton back in 2002) I was amazed to discover that it’s now a chain of 30. The surprise is that the food just doesn’t seem ‘chainy’. Chichester gained a restaurant last summer and this time I ate in Horsham’s – less than a year old itself and handily central for a break from shopping or an after work or a pre-theatre dinner. The food isn’t at all greasy and everything has that authentic Thai freshness to it with herbs and spices singing out of dishes. Plus, there’s typically pretty presentation. Another bonus is Giggling Squid’s tapas concept, available at lunch time. It’s an easier and more affordable way of ordering dishes that you plan to share, and great for the indecisive among us, plus the sizes are barely smaller than regular mains I’ve had elsewhere. There are great value (a bit smaller) set tapas menus if you prefer – from £9.95 for 4 at lunchtime – but we freestyled it. Chicken massaman curry was a must – a favourite of mine with creamy nuts and potatoes – perfect winter comfort food. 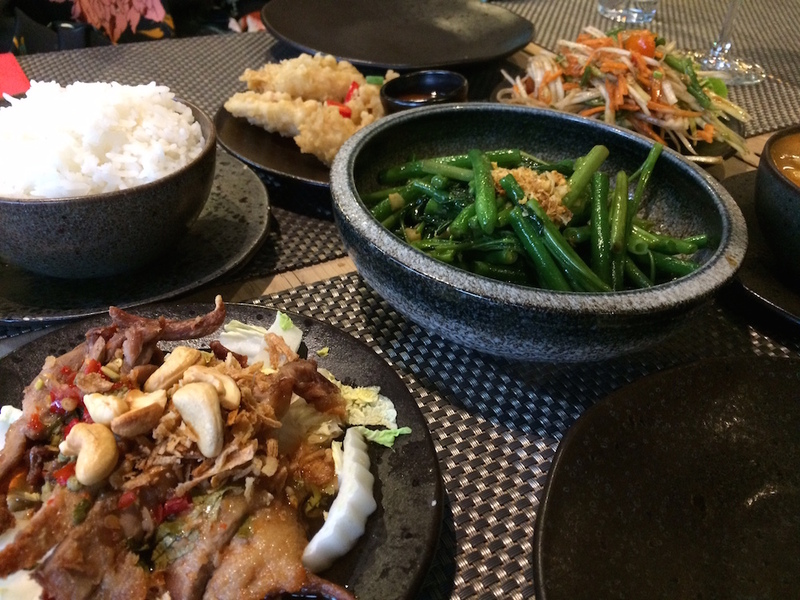 After some deliberation my friend and I also ordered salt and pepper squid because my sister-in-law had told me it’s a Giggling Squid must, plus honey duck, a spicy papaya salad and stir fried morning glory and green beans, with bowls of jasmine rice. 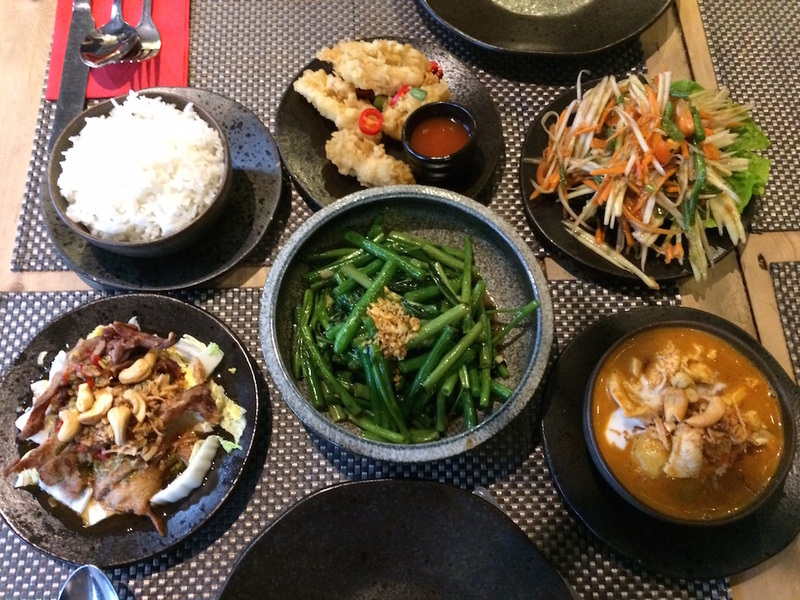 A new option is a starter of a curry tasting platter with pork skewers, squid, vegetable spring rolls and Thai style chicken wings – the latter an East-meets-West dish that’s also a new as a stand alone. On the menu the dishes are described with personal anecdotes – a nice touch showing the family business hasn’t lost its roots. Many are available with different meat or fish options and you can ask for the spicy dishes to be as hot or mild as you like. 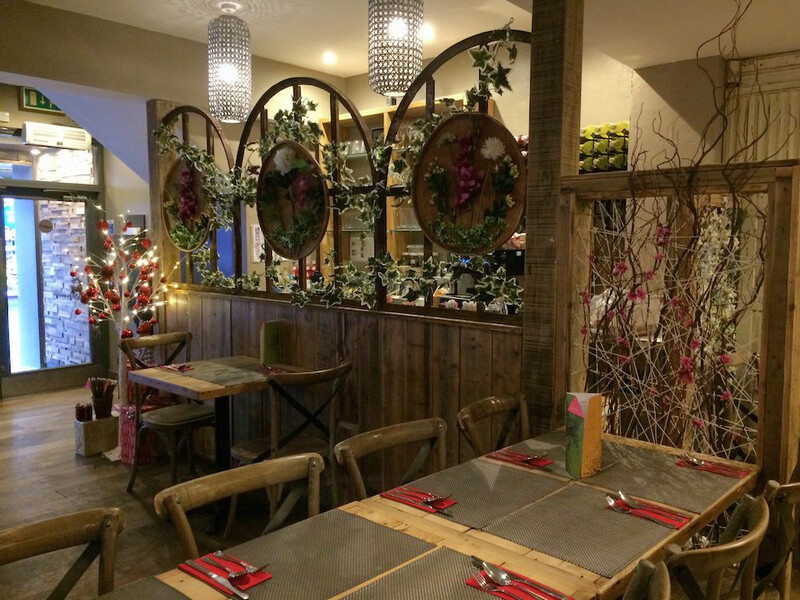 There are also gluten-free and children’s menus, the latter involving smaller tapas. Desserts aren’t a big thing in Thailand – you’ll typically get a platter of fruit, but there are plenty on Giggling Squid’s menu to tempt UK diners. Had I had room I’d have gone for the interesting sounding black sesame ice cream. 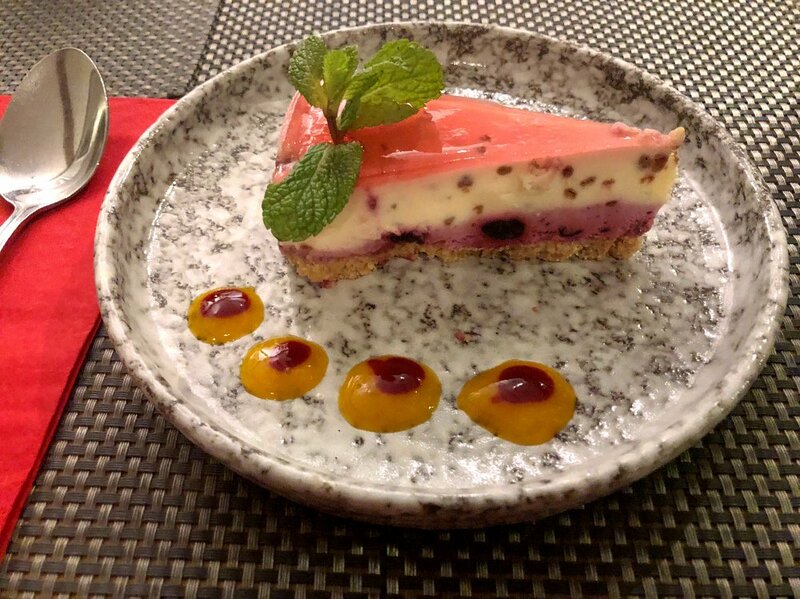 More Westernised puds include Prosecco and muddled berry cheesecake and a chocolate bomb. I was driving, so had just a small white wine and couldn’t get stuck into the Asian-slanted cocktails but the Thai G&T, with kaffir lime leaf and ginger-infused gin sounds a must-try for another time. There’s also a Mekhong Mule and a daiquiri using the Thai spirit Mekhong – a cross between whisky and rum. The restaurant itself has a large upstairs and there are corners with booths. Orchids are naturally part of the decor plus some cheery fake flowers climbing lattices. If you’re nearer Chichester, you’ll find the new restaurant there has smart, loungey banquette seating. 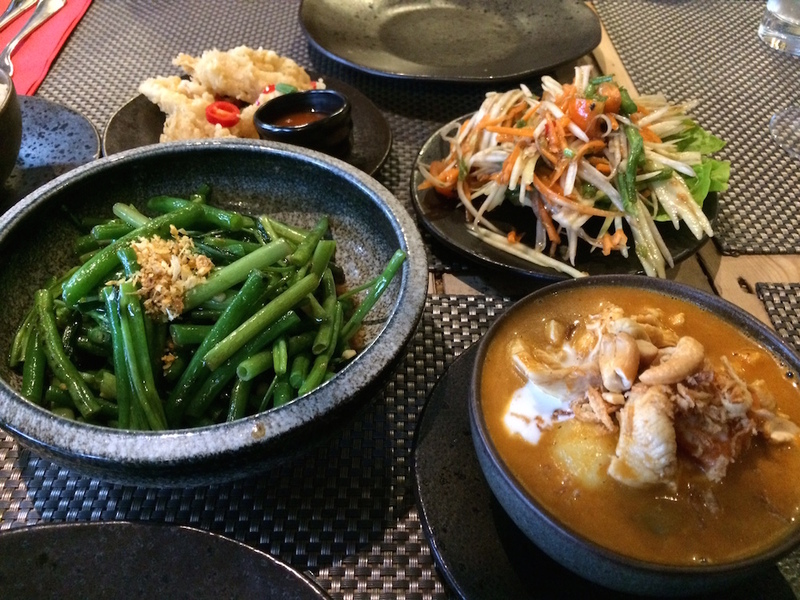 Good for: Authentic Thai food. Easy, sociable sharing with friends or family. A great value shopping pitstop or pre-theatre meal. 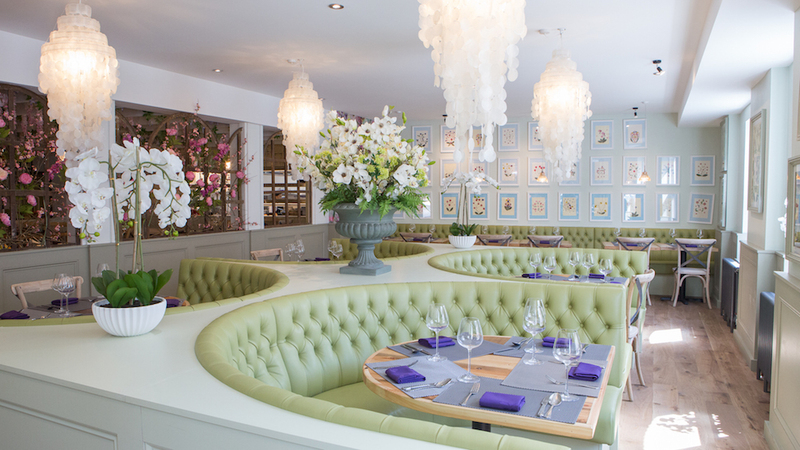 Private dining is available – good for birthdays and the like. Not so good for: The Horsham restaurant is in the middle of the shops so though it’s open till as late as 10.30pm on Fri and Sat nights I’d consider it more as a lunch or early evening haunt. The damage: The lunchtime tapas set menus are very good value for money at £9.95, £10.95 or £11.95 for four dishes. Individual tapas dishes are £3.95 to £4.95. Full size mains are £7.50 – £8.95 (including rice with the curries). 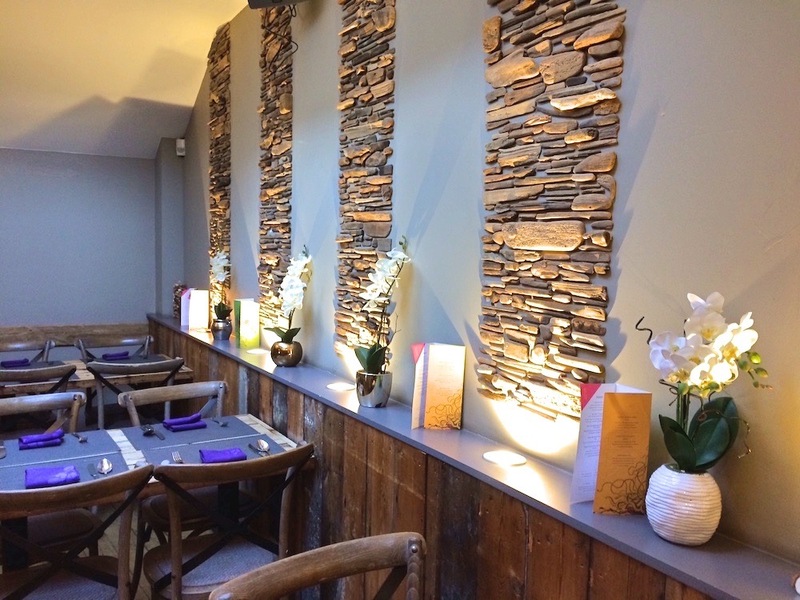 The evening menu mains are around £9.95 – £11.50 for curry, starting lower for stir fries, and up to £15.50 for seafood dishes. Desserts are £4.95 -£5.95. Giggling Squid Horsham is at 1b East Street, you can also order a takeaway via Deliveroo. There are other Giggling Squids at Brighton, Hove, Chichester, Tunbridge Wells and further afield.